Nothing says, cup full of love and cozy like chilly cold outside, and little hands kept warm from holding a yummy cup of Candy Cane White Hot Chocolate. I love making little special drinks like this for my little, well, and big ones. We can get snuggly with our tasty teacups full of love and sweetness. And this drink is yumtastic! 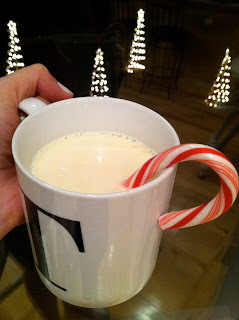 ~Or should I call it, Kandee Kane White Hot Chocolate?!? You can even see out little tree lights shining through the window and my beloved, mustache mug was in the dishwasher, so I had to use the "T" mug that I bought for my sister when she came to visit. Yes, she can re-claim it when she comes for Christmas, or I can change my name to Tandee. 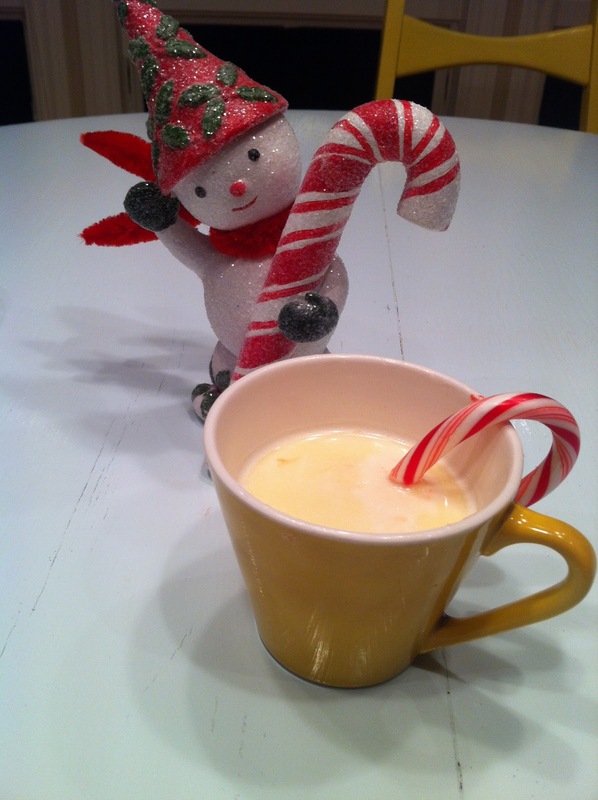 Here's little Mr. Snowman, standing guard of the Candy Cane White Hot Chocolate...it's that yummy. I love making yummy treats for my kids. I want to make them feel like our home is cozy, filled with love, and the smell of mama making them yummy things. We can snuggle together with out mugs full of yumminess and make special memories of happiness and mugs of cheer White Hot Chocolate! Safe from the harsh winter chill, the bitterness of the world...I am creating a happy home of love, a safe little bubble of goodness and delight...that is our home...you are welcome to be a part...please share this recipe and snuggly-sitting-in-front-of-the-fire-watching-white-Christmas-yummy-recipe. Here's my recipe so maybe you can add this to your holiday tradition-treats or just anytime you want to beat the winter chill with something delicious! In a medium saucepan, mix white chocolate chips and heavy whipping cream over medium heat. Keep stirring until all the chips are melted. 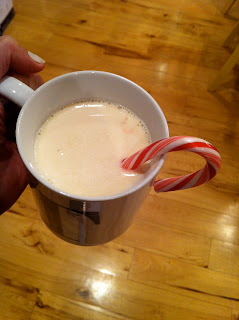 Then, add in the half and half, milk and vanilla and peppermint extract. Keep on a'stirrin' til it all mixed, melted and warm! I like to use a gigantic bowl-like wooden spoon I have to fill up the mugs and teacups. And it makes me feel like the mom from Little House On The Prarie with her big pots cooking over the fire and big wooden spoons. 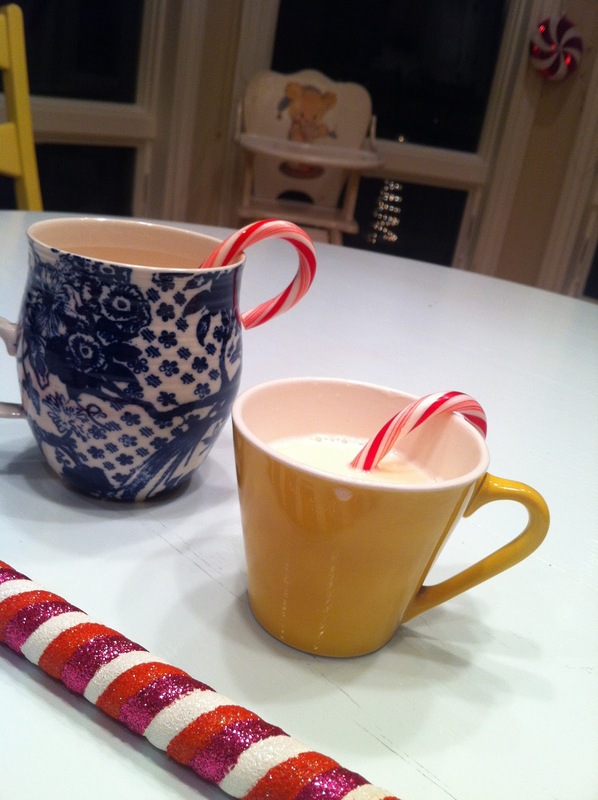 and put a candy cane in each cup....it makes it looks so fun! Jordan took one sip and said: THIS IS AMAZING! This is quite possible the best drink I've ever had! 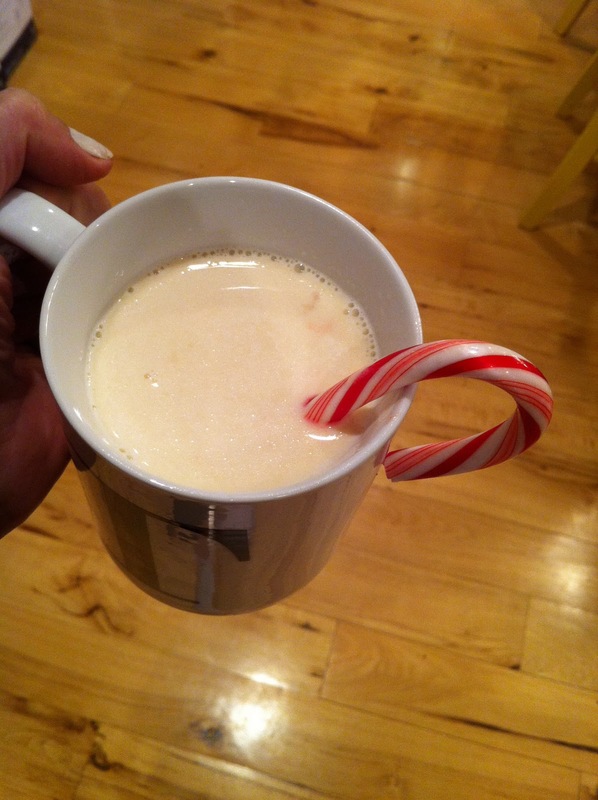 Pretty good to get your 14 year old son to tell his friends on Xbox how good the White Hot Chocolate his mom just made is! I smile as I walked all the way down the stairs! The Fastest Sugar Cookies Ever!